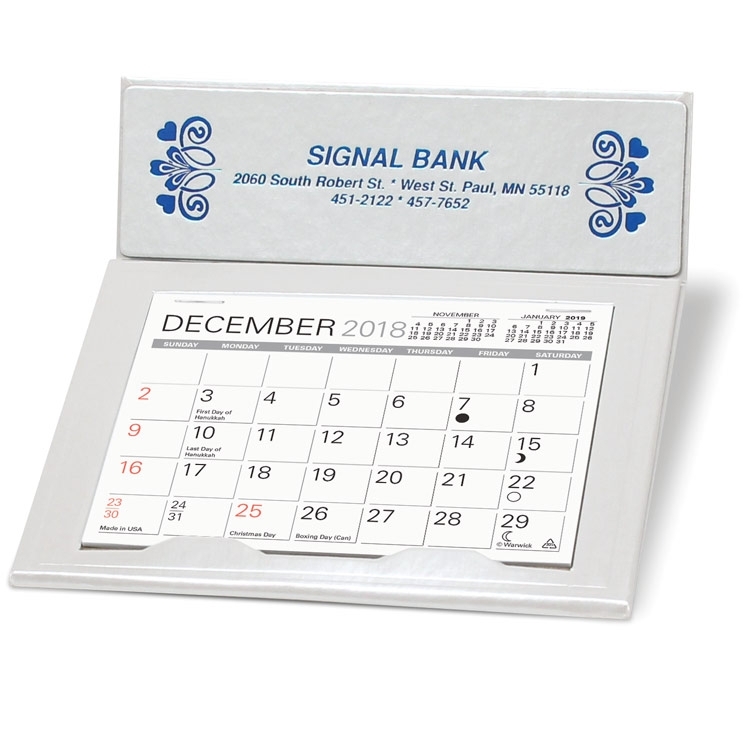 The Cherbourg Desk Calendar offers a foil-stamped imprint and a 4 3/8” x 3 1/4” memo style 13 month date and flip-out phone address section. Standard in sky blue with white imprint or white pearl with blue imprint. See "Options" for other than standard imprint colors. Free mailing envelopes are included, not inserted. No set-up charges for standard one color imprint. Other imprint colors available for additional charge of $30.00(D). FREE mailing envelopes included, calendars not inserted. Production time for all imprinted calendars between September 1st and December 31st will be 10 to 15 days for a one color imprint and possibly longer for multiple color imprints. Please call for current production times.